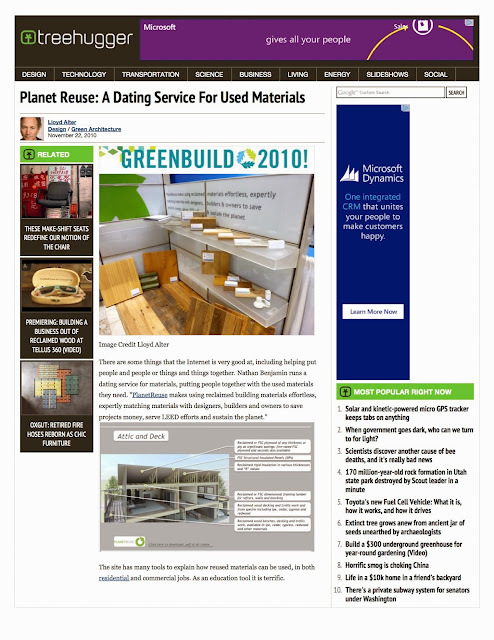 PlanetReuse profiled in TreeHugger.com: A dating Service for Used Materials. Treehugger.com recently profiled PlanetReuse on their eco-minded website. Their comparison of PlanetReuse to match.com was one we quite liked. We pride ourselves on expertly matching sellers and buyers of reclaimed materials and work hard to make sure the connection is a good fit. Read an excerpt of the article below, then click on the link to read the rest. "There are some things that the Internet is very good at, including helping put people and people or things and things together. Nathan Benjamin runs a dating service for materials, putting people together with the used materials they need. "PlanetReuse makes using reclaimed building materials effortless, expertly matching materials with designers, builders and owners to save projects money, serve LEED efforts and sustain the planet." PlanetReuse does for materials what match.com does for people.